FOR THE CAUSE OF ZION! Before the earth existed, the Godhead devised a transcendent plan to establish a place of abode for themselves; a place that would be recognized by all mankind as the centre of Heaven’s administrations on Earth. God’s choice was Jerusalem, Israel! The Sanctuary and dwelling of the Most High God was established in Israel, and as a consequence is known today as the Holy Land. Possessing the understanding that Israel is the central factor in the unfolding of God’s end-time plan will become crucial for all the saints, especially pastors and leaders working and partnering with God to enforce and complete His purposes! A deficiency in this understanding will become a handicap in the ability to process the movements of God. An accurate comprehension of God’s intent through Israel provides access to keys that unlock our capacity to apprehend the fullness of His leading and direction, and the facility to be aligned with His plans in this hour! THE WHOLE COUNSEL OF GOD—PAST, PRESENT AND FUTURE SUMMED UP IN HIS SON, JESUS—IS CENTERED IN JERUSALEM! The battles being fought in the spiritual realm—manifested on earth and presently gaining momentum—are all related directly or indirectly to Israel, this tiny piece of real estate on earth the size of New York City. God’s plan for Israel has been contested by the powers of darkness from the outset. Satan, the archenemy of God has fully recognized the significance of Israel to the fulfillment of the purposes of God on earth, and works incessantly to thwart God’s plan! The battle lines are being drawn and the stage is being set for an explosive showdown! Scripture is very clear in regard to Israel and God’s destiny for this nation, and it is also very clear that to oppose Israel is to oppose God and HIS CHOICE OF ISRAEL! In this hour—this crucial time God has given us to prepare for the return of Jesus—it is of grave urgency that teaching and understanding of this issue be brought to the nations of the earth! It is critical to the safety of nations, and to those in the Church who acknowledge the Lordship of Christ, that they make the choice to partner with God for His will to be done—this means to partner and be an ally of Israel. In the Church we have become so accustomed to taking the Scriptures written to Israel and for Israel, and applying them to ourselves, our cities, and our nations that we have become guilty of completely overlooking or minimizing God’s awesome intention for the Land of Israel, the City of Jerusalem and the Jewish people! 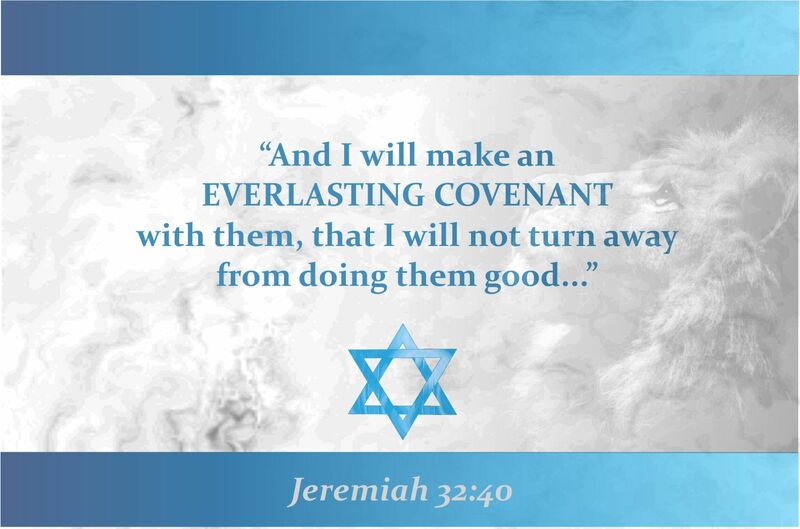 Yes, through Christ we do inherit the promises made to Israel and the benefit of the Covenants, BUT THE PROMISES AND COVENANTS STILL REMAIN THEIRS! Is there any nation other than Israel that God has singled out, set apart and united Himself with them in purpose and in destiny? The Holy Spirit comes to build the House of God that Jesus inhabits, individually and corporately. THE HOLY SPIRIT CARRIES THE WHOLE COUNSEL OF GOD AND HE ALONE HAS THE BLUEPRINT OF THE HOUSE. How important is it then to be filled with the Holy Spirit, and have the heart and mind to be aligned with Him, especially the apostolic leaders who are called to build the House of God. Certain denominations have made the choice to stand against Israel, and many within the Church are now coming dangerously close to aligning themselves to the antichrist spirit of antisemitism arising in these last days! Some Christian leaders and denominations are even openly calling on boycotts of Israel and joining the ranks of the demonic hosts in protest against Israel! If pastors and leaders of churches and denominations, who are called to build apostolically, are devoid in understanding of the significance of Israel to the whole counsel of God, can the House being built be true to Plumb? To be apostolic—as the Church is called to be in the last days, is to have God’s view of His corporate House. It is to be privy to His End Game strategy, His plans and purposes! It is to have His understanding of the battles in His VICTORIOUS CAMPAIGN to overthrow the kingdom of darkness and take His Seat on His Throne in Jerusalem. It is to have His Mind and Heart that encompasses all His objectives corporately and Globally. To see from His perspective is to receive a measure of understanding of the manner in which the dynamics of His Kingdom are PURPOSEFULLY INTEGRATED WITH ISRAEL! The Ark of His Presence is in procession moving with fierce intentionality, heading in ONE DIRECTION, towards JERUSALEM, the Holy City of God, from where He will rule and reign and have complete world Dominion. If builders do not have His heart and His intention for and through Israel then can they be on the same Journey with Him–a Journey that culminates in Jerusalem? Some have discounted the significance of the 4 Blood moons of 2014 & 2015 that will fall on the Jewish feast days of Passover and Tabernacles, on the basis that three of the four moons will not be seen by Israel and because the blood moons of 1493, 1949 came a year after the events they were a supposed to be a sign of (see previous article). 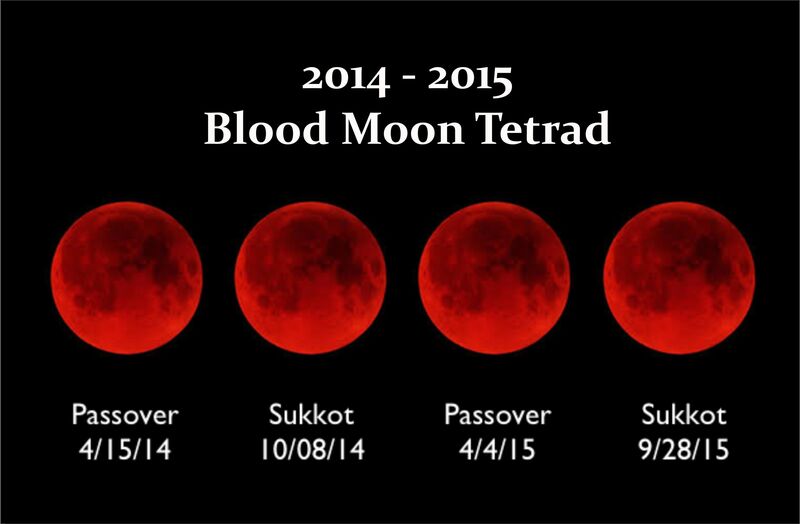 However, I do believe that the significance of the Blood Moons depends on the perspective with which we look at them! God placed lights in the Heavens as signs. What is the meaning of a sign? The Hebrew word used is oth, which can mean: a miracle, a beacon, a signal, or a sign. The definition of the word sign is: any object, action, event, pattern, etc., which conveys a meaning. A sign can give evidence of something past, present or future! What is the significance of the dates of the past three Tetrads that occured in 1493, 1049 and 1967? GOD HAS BEEN ON A MOVEMENT TOWARD THE DESTINATION OF JERUSALEM FROM TIME PAST—ALIGNING WORLD EVENTS TO ACCOMMODATE HIS PURPOSES! In 1493 God opened the door to new world He was holding in reserve for such a time, when the Dark Ages of sin and antisemitism had reached its fullness in the Spanish Inquisition. We see an example of this in the Bible when He waited four hundred years for the iniquity of the Amorites to reach its fullness before He came down to deliver Israel and take them into the Promised Land, “…for the sin of the Amorites has not yet reached its full measure.” (Gen. 15:16). THE TETRAD BEGINNING IN 1949 CONFIRMS THE PROGRESSION OF THE MOVEMENT OF THE PRESENCE ON ITS JOURNEY AS IT MOVES WITH DETERMINATION TOWARDS JERUSALEM! In the New World, God establishes the United States as a world power. The United States in 1949 grants de jure recognition to the State of Israel! The Knesset convenes for the first time! Israel is admitted into the United Nations as the 59th member on May 11th 1949. In December 1949 Ben Gurion proclaims JERUSALEM AS ISRAEL’S CAPITAL, AND THE FIRST KNESSET IS HELD IN JERUSALEM! THE TETRAD BEGINNING IN 1967 COMPLETES THE JOURNEY IN THE NATURAL! In 1967 on June 5th-10th through the miraculous Six Day War, Israel annexes east Jerusalem and JERUSALEM IS RE-UNIFIED under the full governance and sovereignty of Israel for the first time since they lost it to the Babylonians over 2500 years ago! If these Tetrads are supposed to be signs that only give direction or point the way to these events, but came after the fact, then, yes, they are useless! However if they are signs that were purposed to confirm or give evidence of movement occurring in the Spirit, then they are worth investigating! We must also consider whether the Tetrads are sign to Israel, or are they a sign related to Israel? It is clear that ISRAEL IS GOD’S SIGN to the world and His timepiece. If these Tetrads are signs that speak, what is this present one saying? In the Bible two witnesses were required to confirm or seal a contract, I believe the two years of blood moons that form the Tetrad are TWO WITNESSES God is giving the world that we have shifted into the Last days as they will not occur again for over a hundred years. When David was rejected and the kingdom was stolen from him, he sent the Ark back to Jerusalem with Zadok the priest. David believed that he would return if God was pleased with Him. This is a picture of Jesus who was rejected and is re-establishing the Ark of His Presence in Jerusalem in preparation for His Return at the Word of the Father! I believe The Tetrad of 2014-2015 is a sign that THE JOURNEY OF THE ARK CONTINUES UP TO JERUSALEM TO BE RE-ESTABLISHED AS THE CENTRE OF THE KINGDOM OF GOD, IN PREPARATION OF THE KINGS RETURN. ALL PATHS MUST ALIGN WITH GOD IN THE PROCESSION TO SEE THE KING SEATED IN GLORY IN JERUSALEM! Are you with Him in this procession, on the same Journey? Union will take place when we fix our eyes on God and align ourselves in unity with Him! We will go where He is going, which is Jerusalem, Israel! 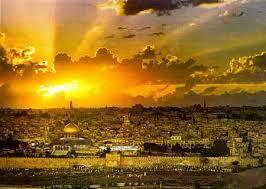 Jerusalem can never be moved and any who attempt to relocate her will be hurt, as promised in God’s Word! When the Conductor lifts His hands all eyes will be on Him! When Christ the King is lifted up all knees must bow to the King of all kings and the LORD of all lords in obedience to His will and His Words! All idols must fall away as idolatry is not tolerated in the Kingdom of God. God is drawing a line and in the days to come it will become clearly evident those who submit to God and those who serve other gods! The deception of the last days will be exceptionally brilliant in its ingenuity and demonic anointing. In the last days our only protection is to be found in knowing, understanding and standing on the Word of God with humility, fear & trembling, not of man or circumstance, but of God, “But on this one will I look: On him who is poor and of a contrite spirit, and who trembles at My word,” (Is. 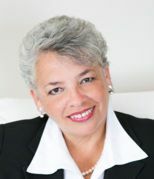 66:2). Theodor Herzl once dreamed of a Jewish state restored after 2000 years of exile and his dream was granted. Likewise the people of the King must now dream the dreams of God for the Kingdom of God to be established in Jerusalem, and begin to travail for the Return of the King! Jesus has positioned Himself in JERUSALEM are you headed for Christian city or for THE CITY OF GOD!